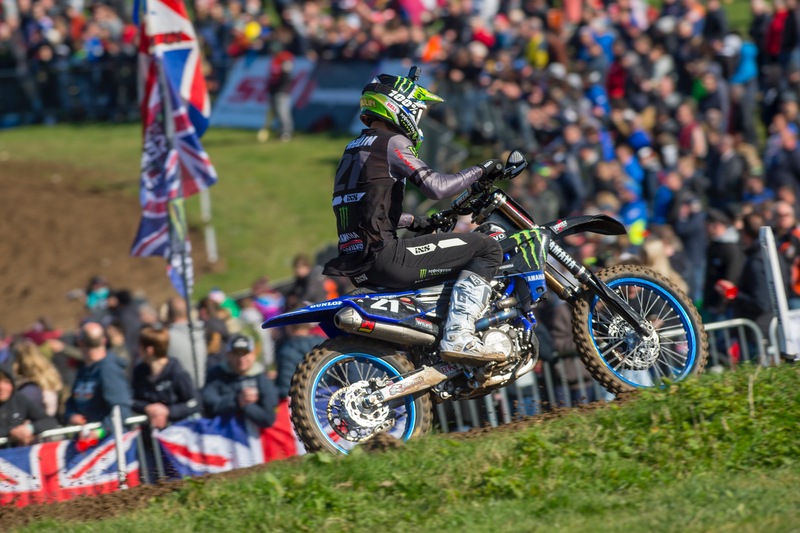 Monster Energy Wilvo Yamaha MXGP’s Gautier Paulin celebrated his first podium of the season at the second round of the FIM Motocross World Championship in Winchester, England, with a stunning third place finish. The result sees the Frenchman move up into third in the MXGP Championship Standings. Monster Energy Yamaha Factory MXGP’s Jeremy Seewer moves up to seventh position in the championship chase after a solid top-five finish in Race 2. Monster Energy Wilvo Yamaha MXGP’s last podium was back in April 2017 where Arnaud Tonus finished third at the MXGP of Trentino. Tonus was less fortunate this weekend. The Swiss rider ran a hot pace in every session. He pushed hard and made some great passes to finish sixth in the first race, but had his Grand Prix bought to an abrupt end halfway through Race 2 when another rider hit him with such force that his foot-peg broke and he could not complete the race. Monster Energy Yamaha Factory MXGP’s Jeremy Seewer put in a Spartan ride this weekend with two fantastic starts and two relentless races where he dug deep for eighth in Race 1 and a season best fifth place finish in Race 2. The Swiss rider was seventh overall in the Grand Prix classification and has progressed to seventh in the MXGP Championship standings. Filling in for Romain Febvre, Dean Ferris’ return to racing did not go to plan. The Australian got faster with every lap completed throughout the weekend, but did not get a chance to prove his potential with a fall at the start of Race 2 cutting his Grand Prix short.